Become the Pocket Pony champion in this adorable mobile game. My Little Pony Pocket Ponies is a free-to-play mobile arcade game that allows players to become a new student at the School of Friendship, where they can compete against characters from the My Little Pony franchise to become the Pocket Pony champion. The game allows players to explore the School of Friendship and complete secondary, level-based challenges, as well as challenge Pocket Pony Masters (Rainbow Dash, Applejack, and Pinkie Pie). In each level, players need to use their Pocket Pony figurines to eliminate enemy figurines that automatically move from the top of the screen to the bottom. To do this, users can tap and hold on the screen to line up each shot, and let go to fire. Each enemy has a certain number of hit points that need to be eliminated before the figure will leave the board. To add some strategy to the mix, players can take up to three Pocket Pony figurines into each stage. Each Pocket Pony has a colored base that corresponds to a special ability that players can trigger while playing. Plus, when a Pocket Pony attacks an enemy figure with the same base color, the attack will deal extra damage. 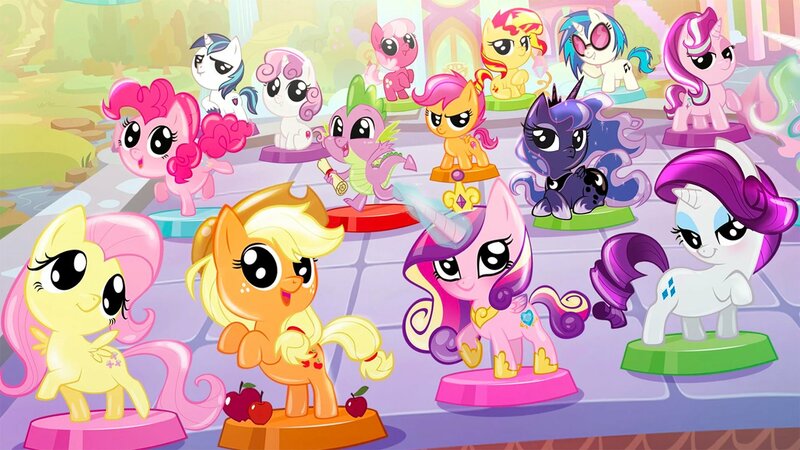 While players start with only a single Pocket Pony figurine, they can collect many more over time, as well as level up these figures up to improve their stats and abilities. My Little Pony Pocket Ponies is available to download for free on iOS devices, and it’s coming soon to Android and Amazon devices. The game is rated E for Everyone. It contains optional in-app purchases, so make sure you change your device settings to prevent littles from making purchases without your consent. Check out the first 13 minutes of My Little Pony Pocket Ponies in our SuperParent First Look below to see this cute game in action.